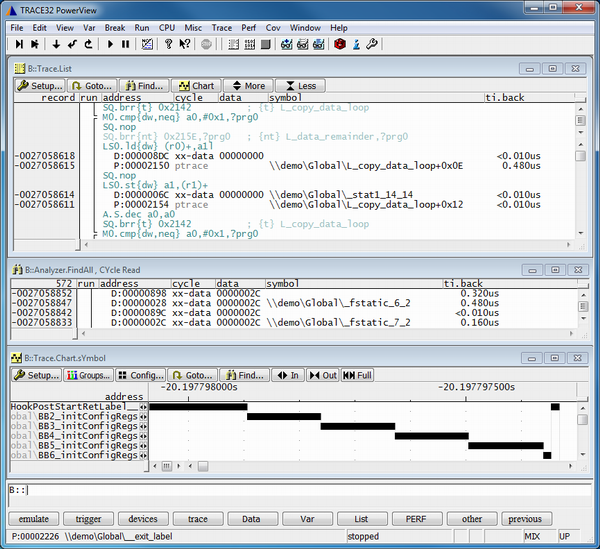 Lauterbach′s TRACE32 software provides a push-button-solution for optimal hardware configuration including a trace port test. Just push the AutoFocus button and a small test programm is downloaded to the target causing worst case test patterns on the trace port. Trace probes with AUTOFOCUS are capable of recognizing data eyes, adjusting reference voltage such that clocks are stable and data channels have broad data eyes. Last not least optimal sampling points are calculated and setup for every data channel.